Ned Stokes: the four of spades. North Hants. Se Gentleman’s Magazine for 1791, p. 141. (I looked up Ned Stokes. Turns out that Edward Stokes was a wealthy and flamboyant American who fell in love with Josie Mansfield. She however was mistress to Stokes best friend and patron, the robber baron “Jubilee” Jim Fisk. The two men quarreled over Josie and things grew ugly when they took each other to court, accusing each other of blackmail over the fair lady. Finally, Ned ambushed Fisk at a hotel and shot him on January 6, 1872. Fisk died and Stokes was accused and tried. He was sentenced to death, but an appeal got it down to manslaughter and he did 6 years in Sing Sing. But it’s the Four of Spades that’s known as the “Devil’s bedpost“. 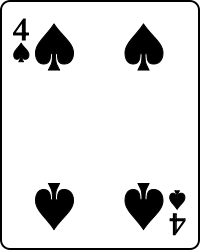 In Cartomancy (fortune-telling done with a normal deck of playing cards rather than a Tarot deck) the Four of Spades is said to foretell an imminent major setback, an unexpected set of circumstances, a great misfortune. I’m guessing that the name refers to “Jubilee” Jim Fisk’s great misfortune in meeting Ned Stokes or introducing Ned to his mistress. Back in 1392, King Charles VI of France listed playing cards as a household expense. By 1397, there was an edict prohibiting people from playing certain games on working days. What’s even more interesting is that specific cards are mentioned in the edict. For centuries now, some cards have enjoyed alternate names, including, but not limited to the Four of Hearts (Hob Collingwood), the Ace of Diamonds (Earl of Cork), the Nine of Diamonds (Curse of Scotland), the Six of Hearts (Grace card), the Queen of Clubs (Queen Bess), the Four of Spades (Ned Stokes) and the Jack of Clubs (a Sunderland Fitter). When cards were first printed, back in the 1430s, the standard suits were Hearts (Herz/Rot), Bells (Schellen), Leaves (Grün), and Acorns (Eichel). In fact, to this day, these cards can still be found in Eastern and Southeastern German decks today for such games as Skat, Scharfkopf and Doppelkopf. However, the four suits most commonly used in most of the world today originated in French around 1480. By the 16th century, the standard design in England is the one we know today as a deck of playing cards. But it’s the Four of Spades that’s known as the “Devil’s bedpost“. There’s the folk story of how the Four of Spades got its name. As the story goes, one Sunday afternoon, a group of men met secretly — as they often did — to play a game of cards. Back in the day, any recreational activity on a Sunday –especially gambling — was forbidden. But young men being as young men are, they took no heed of this and played cards anyway. Just as the cards were dealt out, a stranger appeared and asked if he could join in. Dressed in fancy, the young men agreed to let him play, all the while hoping the new card player would wager, and lose, large sums of money. When it was the stranger’s turn to deal, he began shuffling the cards when he accidentally dropped the Four of Spades. He bent down to pick up the card and one of the young men sitting next to him glanced down to where the card had fallen. To his horror, he saw the ebony edge of a cloven hoof. The young man jumped up and shouted to his friends that the stranger had a cloven hoof! With that, the young men realized that the stranger who had joined them in their game of cards was none other than the Devil. Terrified, they fled the room, vowing never again to go against the rules of the Sabbath. 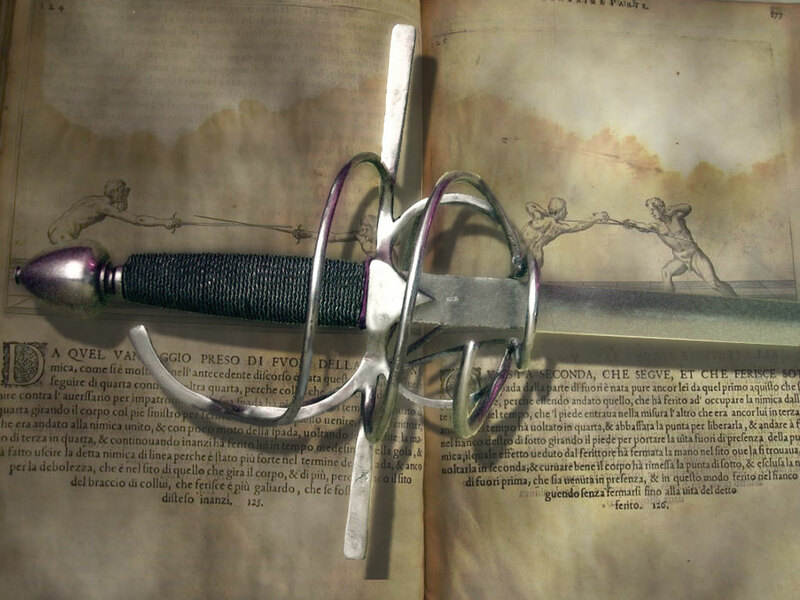 While there’s no indication how old this bit of folklore is, one could assume that it may be as old as the phrase “Devil’s Bones” and “Devil’s Prayerbook” and “Devil’s Book” which date back to the Poor Robin Almanac of the 1670s. It was certainly an established phrase back in the early 1800s in Captain Frederick Chamier‘s time.